Sanjeev Kumar Jha is son of great artist Shri Krishnanad Jha from Harinagar in Madhubani Distt., Bihar. Since his childhood Sanjeev has grown up watching his great father paint. 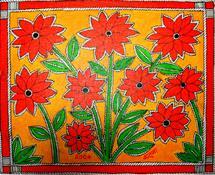 Following foot septs of his father, he has painting tantrik paintings along with paintings on fishes, trees, monkeys, etc. 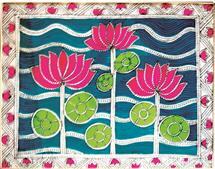 Sanjeev has typical style of his own where he uses horizontal, vertical, diagnal lines and patterns in different colors. He has a very typical style of his own which very unique. 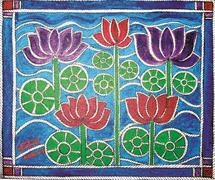 He has exhibited his works in many Governent sponsored programmes across India. Sanjeev lives and works from village Harinagar in Madhubani Distt.